My parents throw a lot of parties. After 9 graduation parties, 2 Rectorpaloozas, and innumerable other any-excuse-for-a-party parties, they have devised a reliable and predictable model. First, they call Red Hot and Blue, a barbeque joint in Laurel, Maryland, and order a tray of pulled pork. Then they order a large bucket of pasta salad from Costco and a few trays of Chick-Fil-A chicken nuggets. A few neighbors bring a side dish, we put the deck furniture on the lawn, borrow a volleyball net and a picnic table from the Falks, put out some drinks, and the party is ready. It is a recipe for success. 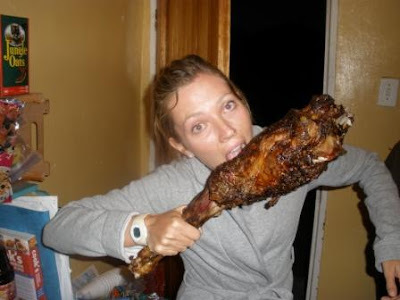 Last week, Bridget and I learned the recipe for a successful party in Lesotho. The occasion for a party was Nthabeleng’s birthday. Our fearless leader was turning 38 and we needed to celebrate. But in a world where Red Hot and Blue doesn’t exist, where you can’t get a 6 foot Subway sub (though I really wish I could right now…), where ground beef comes with a healthy dose of gristle, and where the closest thing to Costco is a store we call “Big China”, it turns out the most cost-effective way to feed a party of 50 is to buy a sheep, kill it, butcher it, and then cook it. So that’s what we did. 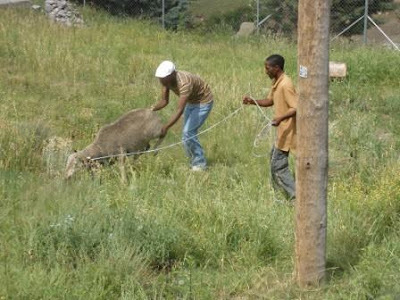 Luckily, finding a sheep is no problem in Lesotho. Sheep, cattle, goats, donkeys, and horses are all as commonplace as people. They are more commonplace than cars. So four days before the party, Nthabeleng came into the office and announced she was going to get the sheep. “Where?” we asked. “Up the street,” she replied. And so she did. She was back in about 15 minutes, having literally just walked up the street to the post office where she found a shepherd with a small flock of sheep and made an offer. We had passed this shepherd innumerable times when picking up mail, without any idea that he was open for business. After securing the appropriate paperwork (stock theft is big here in Lesotho, so you need a certificate of legal ownership before buying an animal), we gave the shepherd R780 (about $80) and the shepherd and his friend brought the sheep down the street to TTL. In the span of an hour, we had found and purchased our sheep and we were off to a good start. 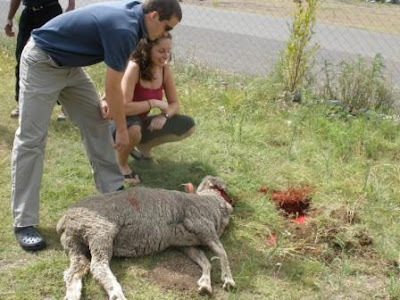 Although I assumed the sheep had a few more days to live – the party wasn’t until Saturday – it was not to be. 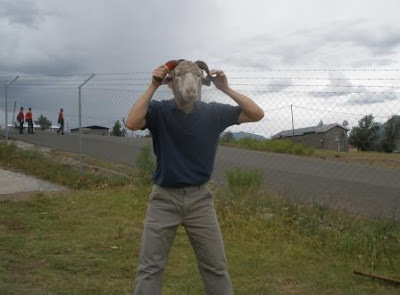 A few of the male employees at TTL got back from an outreach visit, eyed the sheep, and started to get excited. The action began immediately. We braced ourselves for a gruesome scene, but were surprised by the dignity and calmness of the whole process. Fusi dug a small hole in the ground. Thabang and Koenane led the sheep, kicking, but with a rather resigned air, over towards the hole and laid it down on its side. A few of us joined in to hold its legs. With our rather dull kitchen knives, they quickly slit the throat and then broke the neck, letting the arterial blood flow into the small hole and minimizing the pain. The sheep didn’t make a sound. It kicked a few times, convulsively, and in less than a minute the body went limp. 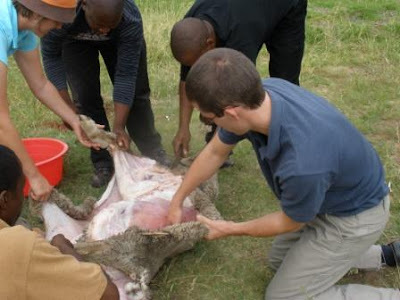 Now the men slit the skin down the middle of the belly and started pushing the skin and wool away from the body with their hands. Ellen and I joined in the process. The body was warm, but surprisingly bloodless, and the skin peeled away easily. Skinned and headless, you could start to forget already that the animal had been living and breathing only minutes before. Methodically and efficiently, Fusi opened the abdomen and cut out the organs and entrails, tossing all the insides into one of our pots. 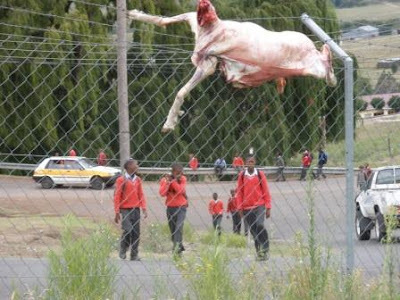 Fusi and Moeletsi grabbed the now-clean carcass and lobbed it onto the barb-wired fence to dry out, while children passed by on their way home from school. The intestinal track required a little extra work. 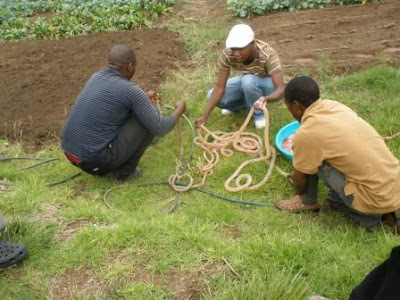 The enormous stomach was opened to reveal what looked like a lawnmower-bag full of grass, which was emptied and rinsed We came around the side of the safehouse to see a funny pink tube lying on the grass—realizing only after a moment that Fusi and Koenane had cleverly attached the intestines to the garden hose in order to flush them of “debris.” Once completely cleaned, the intestinal track was cut into pieces and added to the pot with the heart, lungs, trachea, liver, and dozens of other unidentifiable parts, all chopped to bite size pieces. The pot was spiced liberally, then taken to the kitchen and put on the stove. 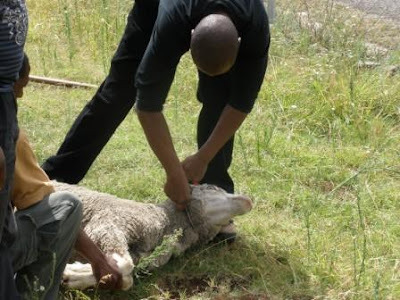 Meanwhile, Moeletsi removed the carcass from the fence and he and Fusi hacked it into large pieces: legs of lamb, racks of ribs, etc. The mekhooa took it upon ourselves to try to preserve the skin—stretching it and pinning it down with nails, washing and salting it, and leaving it to dry in the sun. Nothing was wasted. Two hours after the sheep was purchased from behind the post office, the whole process was complete. Depending on traffic on I-95, it can take longer to drive to Red Hot and Blue. I was impressed. Bridget and I went back to the office to finish a grant proposal. We talked about what the Basotho thought of us as we gawked through the whole process, anxious to get involved but completely inexperienced. Every Basotho man on the premises had helped and seemed to know exactly what to do. Americans are not fit for survival in this environment, we concluded. The whole process was over, and we were back to our own natural habitat: office work. Then Thabang came into the office and motioned for me to come outside. Willing but a little nervous, I followed him towards the side of the safe-house where I found all of the men standing over a steaming pot. “Grab a piece,” Ntate Moeletsi instructed me. I was now part of a male ritual: the post-slaughter eating of the entrails. So I reached for the most meat-like piece I could find - what I believed to be either liver or heart. I chewed on the piece for a solid three minutes as the five Basotho men in the circle took turns diving into the pot for pieces. “Have another,” Ntate Moeletsi told me. Despite my slow-chewing tactics, I still had to eat 6 or 7 total pieces before the pot was exhausted. Liver isn’t bad. Neither is lung. I wouldn’t recommend the unidentified-chewy-fatty piece, though. After joining the other men in drinking the broth from the pot with a spoon, the whole process was complete. 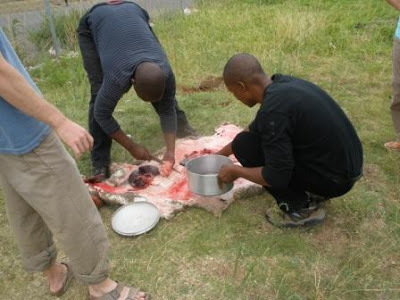 Plus, I had proved my manhood to a group of Basotho guys. Three days later, we fired up the grill and had a great party. As I bit into my first piece of hand-prepared mutton, I felt a sense of satisfaction. Bridget, we’re not in Maryland anymore.